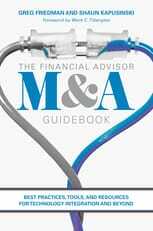 The Financial Advisor M&A Guidebook is a comprehensive guide that walks owners and operations professionals through the steps of strategy, assessment, implementation, adoption and growth, all while considering how to best inspire and galvanize a firm’s most valuable asset – its people. Get The New Book from Financial Advisory Veterans Friedman and Kapusinski. Hi, I’m Shaun, founder of HIFON and Director of Operations for Sequoia Financial Group, LLC. You're just one step away HIFON membership. HIFON is a private, independent study group for RIA Operations Professionals. Founded in 2010, HIFON has quietly built the premier operations community for RIAs. HIFON membership gives you access to best practices, independent advice, and peer-to-peer support you cannot find anywhere else. © 2019 HIFON. All Rights Reserved.